Master writer and storyteller Martin Dockery has proved himself in a couple of Fringes past with wide-roaming, wildly enjoyable tales of exploits around the globe. 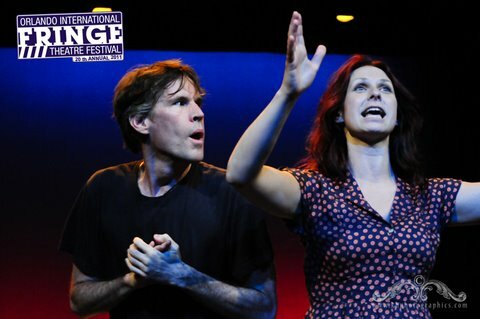 But he’s up to something else entirely in Oh, That Wily Snake!, an ethereal two-person comedy that he performs with actor Vanessa Quesnelle, and a play that is likely to leave audience members with plenty to debate at the beer tent. You’ll know something is different right away because of the bed onstage — a bed that turns out, wittily, to be an inflatable mattress and becomes the magic carpet that takes the two characters, Edmund and Edith, places they never planned to go. Dockery’s writing is slyly comical, and he’s especially funny as a version of the frenzied character he has played in his one-man shows — using all his, yes, wily charms to persuade Quesnelle’s staid and fearful Edith to do what he wants her to do. Oh, That Wily Snake! is like a provocative dream, the kind that makes no sense in some ways and perfect sense in others. For the Ediths of the world, it’s not a sure thing; for the Edmunds, it may just send you to Aruba. Saturday May 21, 11:30 p.m.
Monday May 23, 8:50 p.m.
Wednesday May 25, 6:30 p.m.
Thursday May 26, 10:45 p.m.
Saturday May 28, 7:40 p.m.